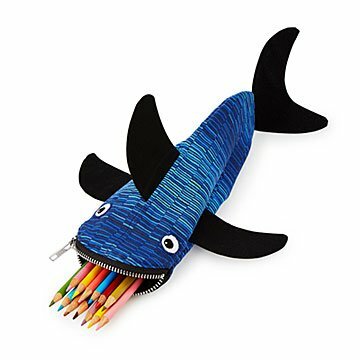 With his belly full of markers, colored pencils, and pens, this handmade shark is a ferociously cute companion for your little one's art projects or your own office supplies. Whether he lurks in a school desk or at a craft table in your home, this precious predator gobbles up writing utensils, makeup, or small trinkets with organizational flair. Handmade by Mary Pow in Minneapolis, Minnesota. MinneBites, handmade bags with bite, take their name from the ‘Minne’ in Minneapolis, Minnesota, where they are lovingly handmade from start to finish by designer Mary Pow. After earning her Master’s of Architecture degree and working for several years in the field, Mary made the decision to take a break from architecture and stay home to raise her kids. While searching for a creative project, she thought she’d give sewing another shot – she learned to sew as a girl, but had disliked sewing from pre-made patterns. Mary borrowed her mom’s sewing machine and applied architectural techniques to create her own patterns. She discovered a process of sewing and design that she loved. Mary built her new-found love of sewing and bag design into a business. Her love of creating bags and cases has even led her to be called a “bag architect”. Spot clean or Hand wash with cold water and a mild detergent. Reshape and lay flat to dry. Iron on cotton setting.